effective July 1. They will replace Tony George, who will no longer serve as President and Chief Executive Officer of the Hulman-George companies but will remain a board member of the Hulman-George companies. "Our board had asked Tony to structure our executive staff to create efficiencies in our business structure and to concentrate his leadership efforts in the Indy Racing League," said IMS Chairman of the Board Mari Hulman George. "He has decided that with the recent unification of open-wheel racing and the experienced management team IMS has cultivated over the years, now would be the time for him to concentrate on his team ownership of Vision Racing with his family and other personal business interests he and his family share. "Tony will remain on the Board of Directors of all of our companies, and he will continue to work with the entire board to advance the interests of all of companies. Our family and the entire racing community are grateful to Tony for the leadership and direction he has provided since 1990. We are pleased that he will continue to be an important part of the Indy Racing League as a team owner and as a member of our Board of Directors, and we wish him every success." Today’s announcement mirrored a report filed by SPEED TV’s Robin Miller two weeks ago; a report that was strongly denied by all parties. 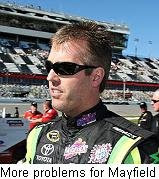 ESPN.com is reporting today that tests performed by an independent laboratory support the original findings that led to Jeremy Mayfield’s indefinite suspension from NASCAR. The name of the individual and the specific test results were blacked out in court documents, but a spokesman for NASCAR confirmed to ESPN that the findings were identical. Medtox Laboratories tested Mayfield’s "A" and "B" samples last week, and discovered the same banned substance originally found by Aegis Laboratories, which oversees NASCAR’s drug testing program. Attorneys for both Mayfield and NASCAR testified in court two weeks ago that the substance in question is amphetamines. Mayfield's attorneys contend that a second, independent lab should have been used to test Mayfield’s "B" sample in the first place, and that the sample was compromised when opened for testing by Aegis Labs. A hearing is set for tomorrow in U.S. District Court, as Mayfield seeks a temporary restraining order that would allow him to compete in Saturday night's Coke Zero 400 at Daytona International Speedway. Truex To Finish `09 With MWR: Despite published reports claiming that Martin Truex Jr. could move to Michael Waltrip Racing’s #55 Toyota as soon as next month’s race at Chicagoland Speedway, Sirius Speedway has learned that Truex will remain with Earnhardt-Ganassi Racing for the remainder of the season. 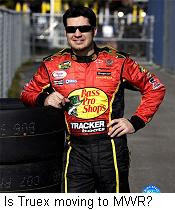 Sources close to the situation say that while an agreement to move Truex to the Waltrip camp for the final few races of the season could still come to fruition, contractual and sponsorship issues will almost certainly keep Truex in the #1 Bass Pro Shops Chevrolet for the rest of the year. 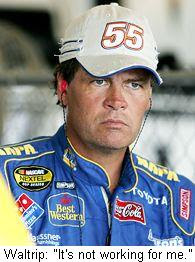 Waltrip, meanwhile, is expected to finish the 2009 campaign in his familiar NAPA Toyota. Sources say that Truex will steer a new, NAPA-backed #56 Camry in 2010, with Waltrip running a limited schedule of 10-12 races (including the season-opener at Daytona) in a companion #55. Michael Waltrip Racing is expected to announce the moves in a press conference scheduled for July 7. NASCAR Claiming Milwaukee Vendor Revenue: The Milwaukee Journal Sentinel reported today that Wisconsin Motorsports, promoter of the Milwaukee Mile, owes NASCAR nearly $1.9 million dollars for the NASCAR Nationwide and Camping World Truck races held there this month. Claude Napier, head of Wisconsin Motorsports, signed an agreement the day before the races were scheduled to take place, stating that he was unable to pay NASCAR’s sanction fee for the events, and agreeing that all revenue from the races would go directly to NASCAR. An attorney for NASCAR subsequently sent a letter to the track’s vendors, concessionaires and program sellers, instructing them to forward the money they owe Wisconsin Motorsports to NASCAR, instead. NASCAR has reportedly paid all of its teams for the two events. Martin Truex, Jr., is expected to announce next week that he will leave Earhhardt-Ganassi Racing to drive for Michael Waltrip Racing next season. Even if Truex bolts, however, EGR President Steve Lauletta said this week that he expects his major sponsor -- Bass Pro Shops -- to remain with the team. Lauletta confirmed that EGR has not re-signed Truex for 2010, but declined to comment on whether Aric Almirola or another driver would replace Truex at the wheel of the #1 Chevrolet. Denials Aplenty: Hendrick Motorsports has strongly denied an internet report claiming that Dale Earnhardt, Jr., will be farmed out to a new JR Motorsports Sprint Cup team next season to make room for Danica Patrick. 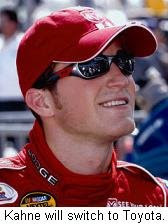 The mikemulhern.net website reported yesterday that the battle for Patrick’s services has boiled down to Hendrick Motorsports and Roush Fenway Racing, with Hendrick “now the heavy favorite to sign Patrick.” Mulhern reported that the Patrick-Hendrick negotiations are “very close to being a 'done deal,'” and that Patrick could take Earnhardt's spot at Hendrick Motorsports, with Junior moving to a new JR Motorsports Cup operation. NASCAR is denying another Mulhern report claiming that the sanctioning body is considering dramatic cuts in next year’s Camping World Truck Series schedule, and could abolish the series outright. 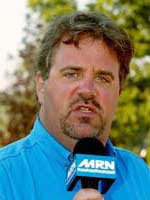 NASCAR Vice President Steve O'Donnell reportedly addressed those rumors in the pre-race drivers’ meeting at Memphis Motorsports Park, assuring teams that NASCAR has no plans to scale-back or eliminate the series in 2010. He said he expects to see new owners, drivers and tracks on the series next season. Milwaukee Mile Short On Cash: Updating a story we first reported last week, the Milwaukee Mile still owes NASCAR money from the Nationwide and Camping World Truck Series races held there two weekends ago. Wisconsin Motorsports head Claude Napier declined to talk specifically about the situation this week, but acknowledged that the legendary speedway will lose money this year. In his words, “I don't want to get into specifics about what we owe and what we don't owe. We are working very closely with NASCAR and in particular we are working on the future." NASCAR has reportedly paid its teams for the two events, and is working closely with the track to resolve the issue. Spokesmen for the IRL IndyCar Series have refused to say whether their teams have been paid for an event there the same weekend. The ongoing discussion regarding Richard Petty Motorsports and its manufacturer affiliations has produced no shorage of headlines in the last 72 hours. Reports have been made, confirmed, denied and contradicted, leaving fans with little choice but to decided who they want to believe, and forget the rest. If nothing else, the story provides an interesting look at how things happen behind the scenes in NASCAR Sprint Cup racing. I told you Monday that there was a strong possibility of Richard Petty Motorsports fielding Toyota Camrys for driver Kasey Kahne, as soon as mid-August. Despite being confirmed by multiple sources within the organization, the story was immediately and categorically denied by RPM. 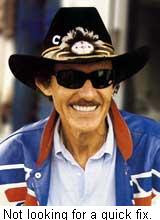 Just hours earlier, Richard Petty Motorsports spokesman Drew Brown responded to the same question by saying, “Richard Petty Motorsports has no plans to switch manufacturers in 2009 with any of our Cup cars. Our people plan to keep winning races with Dodge like they did Sunday and later this year put Dodges in the Chase." Is it any wonder that media outlets contradict each other? And is it any wonder that fans are confused about who -– and what -- to believe? For the record, I have no problem being called on the carpet by a race team for reporting something they don’t want reported. Public relations representatives are under no obligation to tell the truth to the media. They can tell us the whole truth, a half-truth or an outright lie, as the case requires. In fact, there are times where they have to lie to us, in the best interest of their team. Anyone who does a job like mine for any length of time has been called a damned liar – in so many words – on Monday, only to be proven correct a few days later when the official press conference takes place. It’s part of the job, and people generally don’t take it personally. As of now, nobody knows whether Kasey Kahne will drive a Toyota this season or not. I don’t know, you don’t know… King Richard himself says he doesn’t know! I guess we’ll just wait and see. Despite all the denials, however, it is clear that the possibility has been discussed at the highest levels of Richard Petty Motorsports. Take all the hubbub and confusion of the last few days, file it away and remember it the next time you're faced with wildly conflicting media reports on a major NASCAR story. At times like this, the bottom line is simple. Reporters have a job to do, and PR people have a job to do. Sometimes, those jobs put us at loggerheads. Petty On Dodge/Toyota Combo: "Nobody Knows What's Going To Happen." Richard Petty left little doubt yesterday that discussions have taken place about converting at least part of the Richard Petty Motorsports stable to Toyota power. In an exclusive Sirius Speedway interview, the seven-time Sprint Cup Series champion was asked about reports that his team will field Toyotas for driver Kasey Kahne as soon as mid-August. "It's all swirling around," said Petty. "I don't really know, and I don't think anybody knows right now exactly where we're sitting, what we're gonna do, (or) what's gonna happen... three weeks from now, let alone the beginning of next year. "We're like everybody else," he said. "We're trying to put ourselves together with our sponsor deals, make sure we've got (the money) to be able to go. Then we're going to look at whatever we think is going to be best for Richard Petty Motorsports in the short run and the long run. "After being here for 50 or 60 years, I'm not looking for a quick fix," said Petty. "We're trying to put stuff together so that we can go on down the road next year, the year after next (and) the year after that." "We're open about anything right now. So we're going to put everything on the table and... hope we make the right decisions on where we go." Asked about his longtime loyalty to the Dodge brand, Petty replied that loyalty is a two-way street. "You've got to look at it from the standpoint of; can Dodge be loyal to us now that the government owns Chrysler? I don't know if the people (in Washington) are race fans. If they are, then that's going to be great. But if they're not, it affects so many people. There's so much going on out there -- under the table or under the ground -- that we don't know about. So what Dodge does next year -- or Chevrolet, Ford, Toyota or whoever -- we're just going to have to wait and let the dust settle. Then we're going to run in there and pick up the best thing we can." Petty admitted that discussions have taken place about the challenges of fielding two different brands of race car out of the same shop. "I've asked the same question," he laughed. "Really, I have. I said, 'What if?' And I think that's what we're gonna have to do. We're gonna have to say, 'What if?' and see...(what it would take) to be able to do something like that." Petty said he sees at least one major roadblock to the two-manufacturer system: the engine shop. "The cars have got the same wheels, same brakes, same chassis snd same basic body, so all that stuff would be easy. The big deal is how could you do the motor situation? That would be the big question mark. I don't know if it's ever been done, but if it could be done, we could probably do it." It's a full-time job keeping up with the behind-the-scenes maneuvering at Richard Petty Motorsports these days. As we first reported yesterday, sources inside the walls at RPM say plans have been made to field Toyota Camrys for Kasey Kahne beginning in mid-August, as soon as team officials finalize a financial settlement package with Dodge. Those negotiations have reportedly taken a sudden turn in recent days, though, with the possibility now existing for Kahne and his RPM teammates to remain in the Dodge camp, after all. Nobody seems to know exactly what turned the tide back in Dodge’s favor. Speculation ranges from a juicy incentive package offered by Dodge, to a bit of hardball by the automaker holding RPM to its existing contracts. The “juicy incentive” option is highly unlikely considering Chrysler’s recent bankruptcy filing, and Dodge previously allowed Chip Ganassi Racing to move to the Chevrolet camp after its merger with Dale Earnhardt. Inc., despite an existing contract. The most likely explanation for RPM’s sudden about-face is Richard Petty’s personal loyalty to Dodge. Sources say that Reed Sorenson’s #43 would have remained a Dodge even after Kahne’s manufacturer switch, forcing RPM to construct two different makes of cars under the same roof. While such an undertaking is less daunting today than in the past -- due to common body templates and chassis -- the logistics are still considerable. King Richard may not be the sole decision-maker for his team anymore, but his influence within the walls of RPM is still considerable. Sources say his insistence on remaining (at least partially) a Dodge Boy played a major role in this week’s reversal. In the end, after a serious flirtation with Toyota – the second in as many years for team co-owner George Gillett – it now appears that Richard Petty Motorsports may remain in the Dodge camp, after all. Sirius Speedway has learned that Richard Petty Motorsports will begin fielding Toyotas for driver Kasey Kahne in mid-August, with at least part of the team remaining in Dodge livery for the time being. Published reports this week claimed the team will begin fielding Toyotas for Kahne at Chicagoland Speedway on July 11, but an RPM source speaking on the condition of anonymity tells Sirius Speedway that the change will not happen until team officials are able to hammer out a financial settlement with their current manufacturer. RPM co-owner Richard Petty confirmed recently that there has been a dramatic reduction in manufacturer support to the team as a result of Chrysler’s recent bankruptcy reorganization, a fact confirmed by multiple sources. A decision on future manufacturer affiliations for the #19 and #44 cars -- driven by Elliott Sadler and AJ Allmendinger – is pending, and could depend on whether a favorable settlement can be reached between RPM and Dodge. There has been no comment from officials for either Dodge or Toyota, Richard Petty will join us Tuesday to discuss the reports. Sirius Speedway has learned that NASCAR will implement the new, double-file, shootout-style restart procedure on the NASCAR Nationwide Series, beginning at Daytona International Speedway on Friday night, July 3. The new system has been used without issue in the last three Sprint Cup races at Pocono, Michigan and Infineon, and NASCAR officials are now ready to roll it out for Nationwide competition. It is expected that double-file restarts will be utilized soon in the Camping World Truck Series, as well. 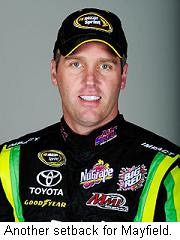 NASCAR filed a motion in federal court yesterday, claiming that an expert witness cited by Jeremy Mayfield falsified his credentials. Mayfield’s attorneys used the statements of Dr. Harvey MacFenerstein to argue that their client should be immediately reinstated for competition, but NASCAR alleged yesterday that MacFenerstein misrepresented his medical degrees, certifications and other qualifications in that May 29 affidavit. In the filing, MacFenerstein claimed to have received a Bachelor of Science degree in medical technology from Midwestern State University of Texas, an MD in clinical pathology from CETED University in Mexico and certification as a Medical Review Officer from two different clinical agencies. NASCAR refuted each of those claims, after a search of Midwestern State's records produced no documentation that MacFenerstein had ever received a degree from the university. In fact, a spokesperson for the university registrar's office offered sworn testimony that "a Harvey Mac Fenerstein briefly attended ... some classes" during just one semester in 1976. NASCAR has asked that Mayfield's legal team be sanctioned for failing to conduct a "reasonable inquiry" into MacFenerstein's qualifications. Mayfield's lead attorney, Bill Diehl, has until July 6 to respond to the latest allegations. Carroll Still Won't Quit: Former Kentucky Speedway owner Jerry Carroll says he expects the appeal of his antitrust lawsuit against NASCAR to continue for at least another month, if not longer. New owner Bruton Smith has repeated asked Carroll to drop his appeal, opening the door for NASCAR to grant him a Sprint Cup Series race at the track next season. But Carroll and his group have refused to do so, and Smith said Saturday that he is not optimistic about his chance for a race in 2010. If Carroll and company win their appeal, the case would go to trial, potentially delaying the process for years. Scott Will Race Hurt: Camping World Truck Series driver Brian Scott suffered a broken right wrist in a Lap 8 crash at Michigan International Speedway Saturday. Despite that injury, Scott plans to compete in Friday night's Copart 200 at the Milwaukee Mile. Scott said he was injured when the steering wheel wrenched from his hand on impact, adding that he knew he was hurt almost immediately. He called the crash, “the hardest hit of my career,” but said he will travekl to the Milwaukee Mile this week and “make the most of the situation." Double Duty For Shrub: Kyle Busch and Scott Speed will drive for Chip Ganassi Racing in the Grand-Am Rolex Series Brumos Porsche 250 at Daytona on July 4. The pair will make their Grand-Am debuts in the #02 Lexus Riley; a team car to the #01 fielded for defending Series champions Scott Pruett and Memo Rojas. The race will take the green flag at 2 p.m. ET, with Busch then taking part in the Coke Zero 400 NASCAR Sprint Cup Series race later that evening. "The Morning Drive" co-host Mike Bagley made it all the way to the Rental Car bus before running out of gas Sunday! That's more than Jimmie Johnson and Greg Biffle can say! Michael Waltrip will step out of the #55 NAPA Auto Parts Toyota for the Toyota/Save Mart 350 at Infineon Raceway, turning the seat over to Patrick Carpentier. Carpentier will also drive Waltrip’s NAPA Nationwide Series Toyota at Circuit Gilles Villeneuve in Montreal in August. Waltrip’s withdrawal from the Iinfineon race may be the first in a growing series of bow-outs for the former Daytona 500 champion. Waltrip said at the start of the season that he would replace himself as driver of the NAPA Auto Parts car if he was unable to keep pace with his teammates, David Reutimann and Marcos Ambrose. With Reutimann 11th in points and Ambrose a surprisingly strong 18th, Waltrip (32nd in the points parade) has little choice but to take a good, long look in the mirror. "I was dead serious,” said Waltrip to ESPN.com this week. “If the other two cars are outrunning me and I'm not keeping up, (to) heck with it. This year, it's not working for me. I just want to have a winning championship race team." Waltrip says he now expects to run only a limited schedule of races next season in a fourth MWR entry, beginning with the season-opening Daytona 500. “It's pretty obvious… that I'm looking at what I'm going to do in '10,” he said. “It certainly makes it easier when you see the performance of the other teams, (to) see what we're building going forward." Sources tell Sirius Speedway that Martin Truex Jr. is likely to replace Waltrip in the NAPA car next season, though Waltrip would like to keep the #55 on his part-time entry. Truex is in the final year of his contract with Earnhardt Ganassi Racing, and has privately expressed frustration with a season that has him languishing 19th in points. 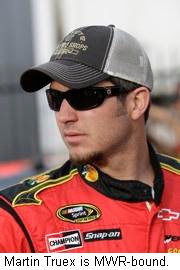 Truex is believed highly unlikely to return to EGR next season, and is the top choice to replace Waltrip. Red Horse Racing has closed the doors on its #1 Toyota Tundra, team effective immediately. The move will sideline former series champion Johnny Benson, who has raced without sponsorship this season after an expected sponsor fell victim to the struggling economy during the offseason. Red Horse will continue to field its #11 Toyota driven by TJ Bell, which enjoys some financial backing from Bell and his family. Red Horse Racing co-owner Tom Deloatch told Sirius Speedway Monday that he continued to field Benson's #1 Toyota until it no longer made financial sense to do so. "When the (financial) tide starts to drop, you have to start throwing things overboard to keep the ship from running aground." There is no official word on Johnny Benson’s future in the Camping World Truck Series, but there are unconfirmed reports that Toyota is attempting to place Benson with another Truck Series team. Talk in the Truck Garage Friday night centered on Randy Moss Motorsports, which already fields a pair of Tundras for Mike Skinner and rookie Tayler Malsam. A spokesperson for Randy Moss Motorsports told Sirius Speedway today that team owner David Dollar only learned of Benson's release at noon Monday. 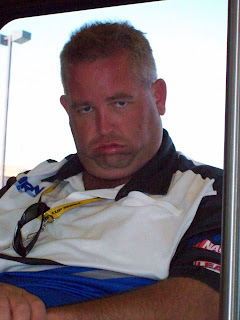 "There is no truth to the rumor about Johnny Benson coming to Randy Moss Motorsports. It is an unfortunate situation for Johnny, but Randy Moss Motorsports will continue their two-truck program with Tayler Malsam and Mike Skinner." Cuts At RPM, Penske Says All Is Well: Jenna Fryer of the Associated Press is reporting that Richard Petty Motorsports has laid off nine employees and cut salaries for virtually all of their remaining staff. The move comes as a result of what the team says are shortfalls in financial support from Dodge, in the aftermath of Chrysler's recent bankruptcy filing. RPM officials are reportedly anticipating significant monetary cutbacks from Dodge, and co-owner Richard Petty said last week that the bankruptcy has already slowed the flow of cash into the team. Fellow Dodge team owner Roger Penske said Sunday that said Dodge has continued to support his team fully in recent weeks. Penske said Dodge “paid the bills we submitted to them, and they're on time. I don't know what (Petty) is talking about."